Get Your Custom Logo Pillow Boxes, Wholesale Custom Logo Pillow Boxes made in Custom Shapes, sizes, and layouts. We offer quality and error-free packaging services with free shipping in all world. 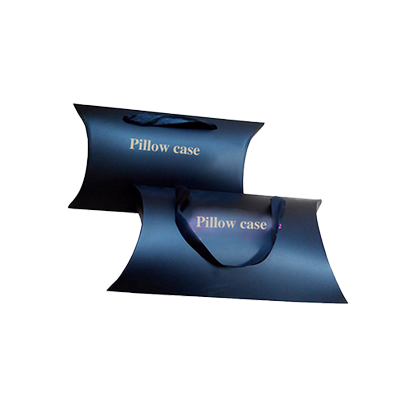 Packaging PAPA offers various customizations for Logo Pillow boxes. You can have desired shapes, sizes and colours for the boxes. 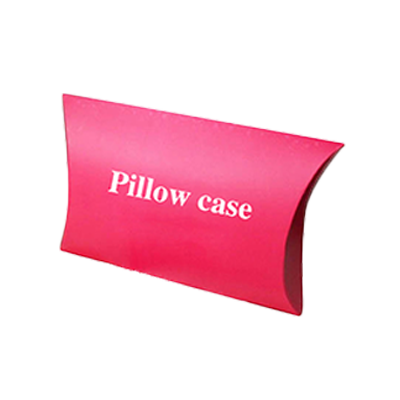 We have several thematic choices to make your custom logo pillow boxes attention-grabbing. The significance of strong materials and quality inks cannot be undermined for the printing of packaging products; therefore we use strong stocks and finest inks. 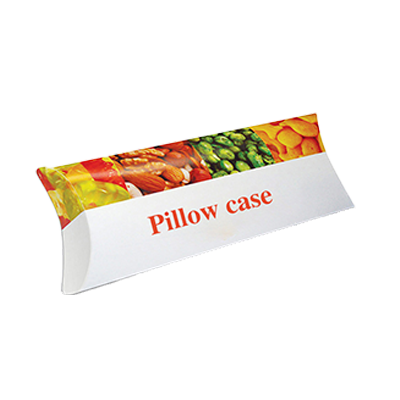 Pillow boxes are one of the most widely utilised packaging boxes. For different occasions, these boxes can be customized for gifting a variety of items. Designing an innovative Pillow box requires professional expertise. Packaging PAPA is a renowned printing company that has been gratifying the packaging requirements of thousands of individuals and businesses across the board. The dedication to deliver superior printing services has earned us a distinctive identity in the market. Perfect Printing: Our state of the art digital and offset presses and advanced techniques assure premium printing. Our finished products are unrivalled in quality and design. Fast and Efficient: Packaging PAPA strives hard to provide the best to its clients. Our production team makes sure that all the orders are printed before deadlines. On time shipment is one of the core values of our company. Shipping Services: Packaging PAPA offer free shipping services all over the world. As established firmly that Packaging PAPA rejoices in facilitating its consumers to the maximum limits, then why burden them by charging for what we deliver to them. Your packaging products are delivered to you definitely free of cost right at your doorstep all over the world. For our clients living outside these regions, our shipping costs are the minimum in the market. However, this offer of free shipping is valid on standard orders only, if you are in a hurry and cannot wait for 6 or more days for your product, we have expedited delivery choice which gets your product in your hands within 6 business days. Even our expedited shipping costs are much less than the usual offerings in the market. Looking for a startlingly designed Pillow box? Packaging PAPA has numerous exciting choices for you. Our Free Designing Services allow you to have several design choices for your Custom Logo Pillow boxes without die cut and setup charges. Our accomplished graphics team will assist you to have pertinent artworks for the boxes. Eco-friendly Packaging: Packaging PAPA makes use of 100% biodegradable substances for printing. It is a known fact that our planet is in a horrible state at the moment. Toxic land waste has imposed hazardous health effects to human beings and the pollution brewed through the wear and tear of the wasted materials has literally shredded the ozone layer into its most pathetic state. Packaging PAPA believes that all possible efforts should be made for the conservation of land wastes and even the smallest steps should be taken strongly to prevent further deterioration of the current circumstances. For this reason, we recommend an increase in “Eco-friendly” packaging strongly to our customers. Our Eco-friendly packaging products establish and strengthen the fact that quality and finesse in packaging “can” be achieved without necessarily using hazardous materials in your packaging production. Customer Care Center: We believe in facilitating our clients in every possible way. 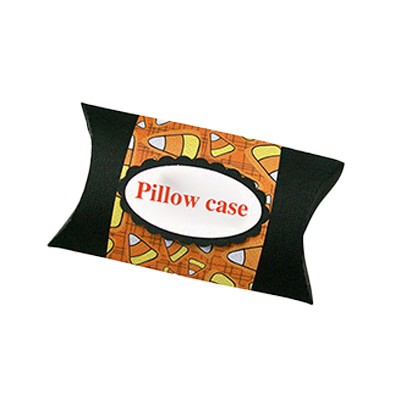 Our 24/7 customer care centre has skilled Call Sales Representatives to address your queries regarding custom logo pillow boxes. Be exceedingly creative with Packaging PAPA. Custom Logo Pillow boxes can be printed with a variety of themes, materials and finishing choices. These boxes are utilised as gift boxes for several events. Cardboard and Kraft pillow boxes are the most popular kinds which are customized with striking sizes and shapes. Windows in these boxes improve the visibility of the products. CMYK/PMS colour technique allows having unlimited colour choices for the boxes. You can even have handles for convenient carriage. All sorts of fonts and images can be printed on the Pillow boxes. Decorative accessories like ribbons, buttons, laces, glittery ropes, bows, paper flowers and butterflies can be attached to them. Catchy captions will make the boxes more appealing. For each event have a superb custom logo pillow box that says it all. For birthdays, Christmas, Valentines’ and weddings Custom Logo Pillow boxes with marvellous designs and themes are available. You can have names printed on the boxes along with the happy birthday wishes. If it is your little sister’s birthday make her feel more special with a classy pillow box that serves as an insignia of never-ending sibling love. Christmas Pillow boxes can be made enticing with relevant colour schemes. Give your valentine a magnificent Pillow box with his/her favourite chocolates. Children Pillow boxes make ideal party favours; add a tint of creativity by having them printed with their favourite cartoon characters. 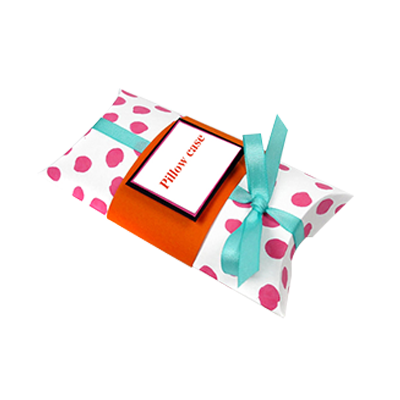 For packaging handmade soaps printed Pillow boxes are a great option. Place your jewellery and greeting cards in excellent Custom Logo Pillow boxes. Wedding Pillow boxes can be used for many purposes. For wedding favours, these boxes are an ideal option. 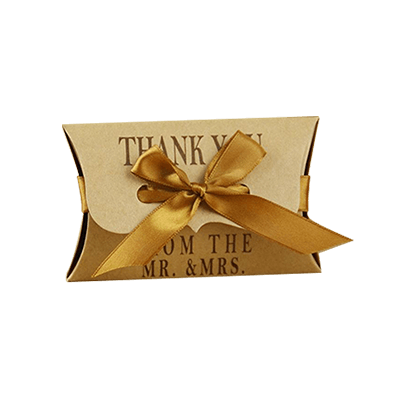 Groom and bride should have exclusive pillow favour boxes designed for their guests. Baby shower Pillow boxes with blue and pink colour tones look spectacular. Make all your festivities memorable with stupefying custom logo pillow boxes! Personalized Pillow Boxes | Custom Pillow Luxury Gift boxes | Custom Kraft Paper Pillow Soap Boxes Custom Small Gift Pillow Boxes | Custom Fancy Paper Pillow boxes | Custom Large Pillow Boxes | Custom Luxury Pillow Boxes | Custom Handle Pillow Boxes | Custom Window Pillow Boxes and much more!